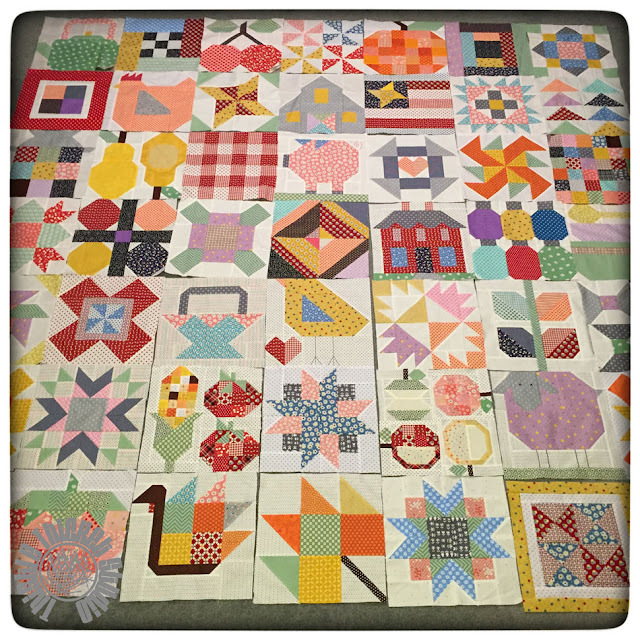 Believe it or not, my Farm Girl Vintage blocks are finally completed! I've had so much fun with this sew along and want to thank Lori Holt of Bee In My Bonnet for all the fun - and for asking me to be a guest blogger for one of her blocks. 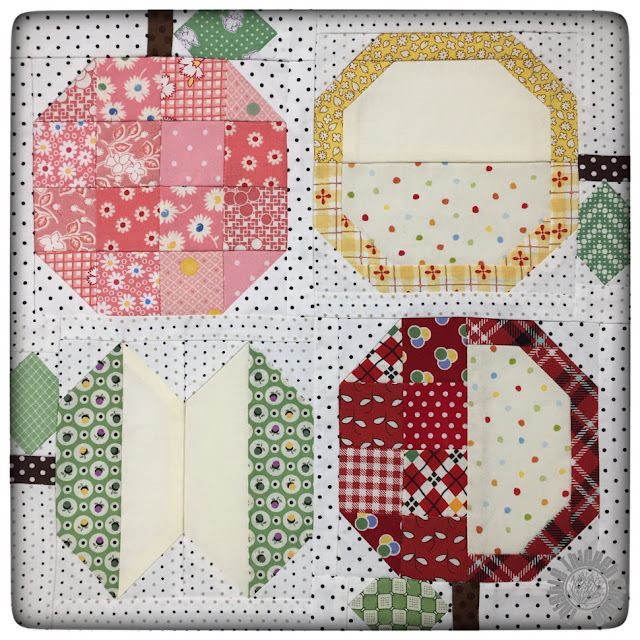 I purchased Lori's companion blocks that she has available through the Fat Quarter Shop to round out my set of blocks instead of making duplicate blocks. I made a total of 49 12" blocks to make a 7x7 layout. I haven't decided how big of a border I will add, but the quilt should finish out somewhere around 100" square. 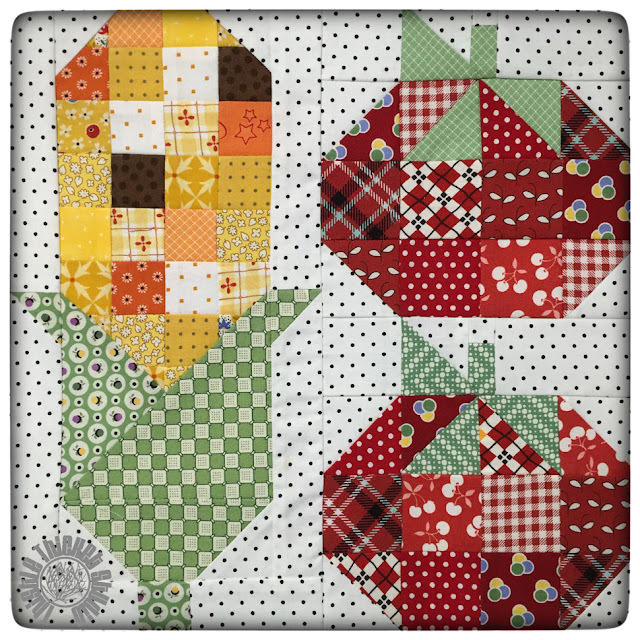 I made my own Apple Picking block, combining blocks in Lori's Apple Picking Quilt pattern and her apple core block from her "Quilty Fun" book. I am so happy with how this one turned out! I just loved the Corn and Tomatoes block when I saw Lori post it on Instagram during one of her retreats and knew I just had to have it in my quilt. Although we don't raise corn (or tomatoes for that matter) on our farm, there is a lot of corn raised in western Kansas. For my block, though, I decided to make it Indian corn! 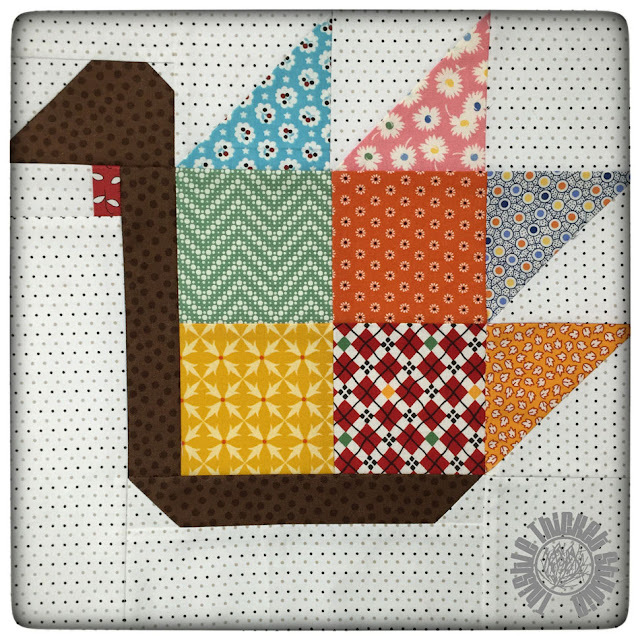 For the last block, I found this free Tom Turkey block on Lori's blog and thought he would fit right in with the rest of the barnyard animals in my quilt. He's legless right now, but I'll get him some legs soon! I couldn't wait to lay all of the blocks out to see how they played together. I just love all the happy colors! Even standing on a ladder I couldn't fit all the blocks in this photo. Next up will be sashings and corners and finally a border. I'll share a finished photo when its quilted and bound - but who knows when that will be! Hope you've enjoyed following along with my Farm Girl Vintage Sew Along. Now back to working on some of those UFOs I had planned on finishing this year! Wow! Congratulations on working all the way through. The blocks look great together. I look forward to seeing how it comes together now! It's been really fun following you along on your adventure with these blocks! Loved your stories on how everything relates to your life on the farm. Looking forward to seeing how it all comes together.